The library now offers free, live, one-on-one tutoring for all ages through Tutor.com from noon-midnight everyday. When you log on with your library card, you’ll be connected to a live person who will help you through your toughest homework questions. You can even upload an essay and get detailed feedback within 24 hours. 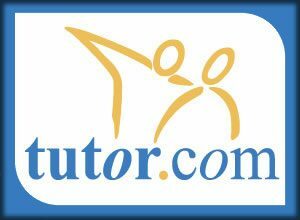 Click here to login to Tutor.com. Enter the full 14-digit number on the back of your library card to get started. Click here to view a list of tutors in the area. Please Note: This list is maintained by the Gail Borden Public Library. Neither libraries, its staff and/or management endorse or approve any individual or service included in this list of private tutors. The library subscribes to a number of databases to aid in your research and learning. Most require you to enter the entire 14-digit barcode number found on the back of your library card. If a PIN number is required, it’s the last 4-digits of your library barcode number. Britannica Library: The Encyclopaedia Britannica enhanced with research tools, history highlights, and current news. Gale Virtual Reference: Gale Virtual Reference Library provides access to a world of reliable information for students, academics, and the general public. This includes titles in areas such as arts, biography, business, history, law, literature, medicine, geography, religion, science, technology, and more. Gale Virtual Reference is available in the library or from any remote location. NoveList Plus K8: NoveList Plus K8 is a database of reading recommendations for kids. It is a comprehensive source of information about books that includes expert recommendations, reviews, articles, lists and more. It is a great way to find more books for reluctant readers! Khan Academy: Khan Academy offers practice exercises, instructional videos, and a personalized learning dashboard that empower learners to study at their own pace in and outside of the classroom. We tackle math, science, computer programming, history, art history, economics, and more. Our math missions guide learners from kindergarten to calculus using state-of-the-art, adaptive technology that identifies strengths and learning gaps. We’ve also partnered with institutions like NASA, The Museum of Modern Art, The California Academy of Sciences, and MIT to offer specialized content. Mango Languages: Mango is an online language-learning system that can help you learn languages like Spanish, French, Japanese, Brazilian Portuguese, German, Mandarin Chinese, Greek, Italian, Russian and more. MUZZY: MUZZY is the world’s #1 language course for children, featuring popular animated characters, rich immersion methodology, and engaging stories, games and exercises. The award winning program now has a whole new generation of interactive content that will emerge for today’s tech-savvy children and all levels of early language learners worldwide. Please use your 14-digit library card number to access Muzzy Club. If you are on a mobile device, the Login and Password are both EllaJohnson. Testing & Education Reference Center: The Testing & Education Reference Center is a start-to-finish resource with all the information and support materials needed to succeed in education. There are over 300 practice tests and courses, dozens of ebooks with valuable material, information on over 4,000 accredited schools, a scholarship search, and even a resume builder! You can select help by your school level. TumbleBooks: Check out Tumblebooks, an online ebook library just for kids!